Most people know that fall doesn’t really exist in Santa Barbara. We do experience those crisp mornings, leaves that change from kelly green to crimson red, that golden light that only shines on late autumn afternoons. We get these beautiful gifts from nature, but not really until late November and only for a few weeks. But occasionally we’re blessed with a chilly, breezy, sunny morning where it just feels like fall earlier than expected. This is one of those mornings. What better way to celebrate that with a cinnamon apple cake? This is a throw out to my girl, Connie, who is one of the best para-educators I’ve ever worked with. She discovered this recipe and posted it to her Facebook page which is where I found it. Her birthday is coming up in about a week so Connie, this one is for you! Recipe Notes: This is a VERY simple recipe with VERY simple ingredients and because of that it is delicious and so easy to make! The flavors are on point. If you have a 9-inch spring form pan available, I would use that rather than a regular round cake pan. It just makes it easier to keep the cake looking lovely and in tact when serving. Also, my never-ending struggle in baking is to not overcook or undercook my baked goods. Unfortunately, I undercooked this. I used a toothpick to test the cake before pulling it out of the oven but I didn’t trust it. Moral of the story, trust the toothpick and give this cake about 10-12 extra minutes of oven time. DIRECTIONS: Preheat oven to 350 degrees and lightly grease a 9-inch round cake pan. In a medium bowl, mix together the eggs and oil. Add the cinnamon, white and brown sugars, and vanilla extract and mix until combined. Add the flour, salt, baking soda, and baking powder, and mix until thoroughly incorporated. Fold in the apples and the nuts and pour batter into prepared pan. Bake until a toothpick inserted into the center comes out clean, about 45 minutes. Let cool for 15 minutes before slicing and serving. Enjoy. Yes, I know it’s not Sunday and I also know that this does not involve a moment of baking (unless you count roasting vegetables) but this is worth sharing. I was trying to find a healthy pasta recipe to make for dinner this week and stumbled upon this. And damn, is it good! Now, I’m not gonna lie. Prepping all of the veggies is a tad bit tedious and I don’t look nearly as perfect as Giada cutting these up (but in truth, who does?) but again, it’s all worth it! Oh, and just a side note… I added extra cheese (of course). DIRECTIONS: Preheat the oven to 450 degrees F. On a large heavy baking sheet, toss all of the vegetables with the oil, salt, pepper, and dried herbs to coat. Transfer half of the vegetable mixture to another heavy large baking sheet and arrange evenly over the baking sheets. Bake until the carrots are tender and the vegetables begin to brown, stirring after the first 10 minutes, about 20 minutes total. Meanwhile, cook the pasta in a large pot of boiling salted water until al dente, tender but still firm to the bite, about 8 minutes. Drain, reserving 1 cup of the cooking liquid. Toss the pasta with the vegetable mixtures in a large bowl to combine. Toss with the cherry tomatoes and enough reserved cooking liquid to moisten. Season the pasta with salt and pepper, to taste. Sprinkle with the Parmesan and serve immediately. Oh holy hell! These light pillows of sweet loveliness are all that is right in the world. The title of today’s blog is a throw back to Seinfeld. Remember that episode when George wore a velvet jumpsuit? Yes, that’s right, I’m that old that I’m referencing Seinfeld. It’s just a brilliant show all around! Anyway I thought of the quote, “What is that, velvet?” because that is exactly what this batter is, velvet. It is silky smooth, light, and velvety. And oh so pretty. Seriously, you have to make these! The brown sugar glaze is more like a salted caramel syrup. That saltiness mixed with the sweetness of the butterscotch is perfection. Yes, you will gain weight just looking at them but every caloric filled morsel is worth it. Notes: The batter made 30 muffins rather than 24, and there is an overabundance of glaze (which will be a fabulous topping for vanilla ice cream later – yes, that’s how I roll). Also, I baked these for a few minutes less than what was called for and I’m glad I did. They cooked very quickly. Oh and in all of the sweet recipes I make, I use far more vanilla than called for. I believe vanilla is magical, and therefore I overuse it. Butterscotch Muffins: Preheat oven to 350 degrees. Combine the melted butter, oil and sugars in a large mixing bowl and beat for 2-3 minutes. Add the eggs one at a time, beating well after each addition. Sift together the flour, baking powder, baking soda and salt and add one third to the butter/sugar mixture and mix until just combined. Add one cup buttermilk and mix until combined. Repeat alternating flour and buttermilk, ending with flour and mixing just until combined after each addition. Stir in vanilla and butterscotch chips. Divide batter into muffin tins lined with paper liners and bake about 25 mins or until a toothpick inserted in the center comes out clean. Remove muffins and allow to cool on a wire rack. Brown Sugar Glaze: Melt butter over medium heat in a small saucepan and stir in brown sugar. Cook about 5 mins until sugar is completely dissolved. Add salt and heavy cream and cook about two more mins. Drizzle over cooled muffins. Five grocery stores, many grocery store employees, multiple phone calls, 1 face-time call, and one major mistake on my part later, I pulled these muffins from the oven. It is a wonder they actually came to fruition this morning. It all started yesterday when we were grocery shopping. Trader Joes was out of chocolate chips, to which I say, “really? !” But no problem. I told Paul he’d have to make his regular Sunday grocery store run to get something I forgot, but of course need. He happily agreed because he very kindly enjoys making these trips. So around 8:42 Paul made his way to pick up his Sunday morning coffee and chocolate chips, returning home happily. All was well in the kitchen. That is until I realized I needed espresso powder. I know it was “optional” but espresso powder enhances the chocolate flavor to a rich loveliness, which was enough to make me want to add it into these muffins. So off Paul accepts the mission to find espresso powder. 1st stop: Gelsons, 2nd stop: Whole Foods, 3rd stop: Vons, 4th stop: Albertsons, 5th stop: Ralphs. Ralphs was the winner with the prefect espresso powder product. While there, Paul and I (via face-time technology ~ what did people do before the magic of iPhone land?) looked for white sparkle sugar or pearl sugar but to no avail. Paul’s comment, “You need to start planning this on Wednesday so we can order ingredients on Amazon.” Sur la Table, here we come! Finally… one of us, namely me, may have gotten distracted by my virtual stroll down Ralphs’ isles searching for not so obscure items and may have forgotten to add the brown sugar that was so obviously called for in the recipe. After spooning the batter into each muffin cup and coincidentally taking a small taste of the batter, I realized it tasted like crap. I immediately dumped (not gently) the dough back into the bowl and beat in the sugar. The funny thing is, the batter was much lighter after using my hand mixer. Originally I stirred the mixture with a spatula but it was dense and heavy. The after-thought- sugar-added batter was light and airy. This is a very easy recipe with amazing results. Just don’t follow my mission impossible lead. By the way, I don’t use any of the special ingredients called for by King Arthur. But with that said, they have amazing recipes. DIRECTIONS: Preheat the oven to 350°F. Line a standard muffin pan with paper or silicone muffin cups, and grease the cups. In a large mixing bowl, whisk together the cocoa, flour, sugar, baking powder, espresso powder, baking soda, salt, and chocolate chips. Set aside. In a large measuring cup or medium-sized mixing bowl, whisk together the eggs, milk, vanilla, and vinegar. Add the wet ingredients, along with the melted butter, to the dry ingredients, stirring to blend; there’s no need to beat these muffins, just make sure everything is well-combined. Scoop the batter into the prepared muffin pan; the cups will be heaped with batter, and the muffin will bake into a “mushroom” shape. Sprinkle with pearl sugar, if desired. 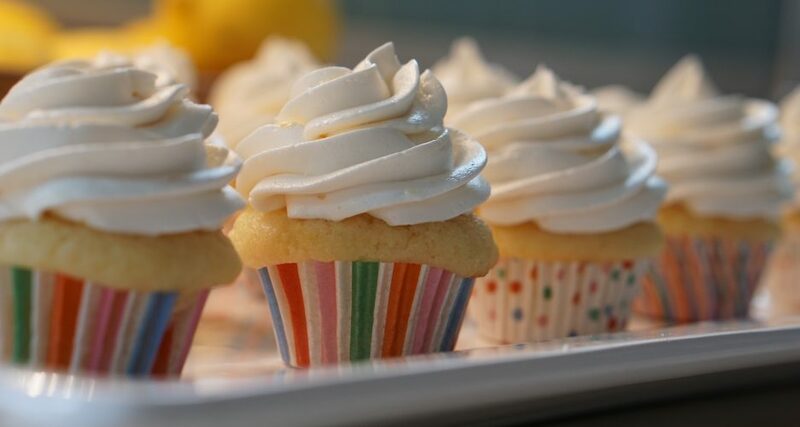 Bake the muffins for 20 to 25 minutes, or until a cake tester inserted in the center of a muffin comes out clean. Remove the muffins from the oven, and after 5 minutes remove them from the pan, allowing them to cool for about 15 minutes on a rack before peeling off the muffin papers or silicone cups. You know that Christmas carol, “It’s the Most Wonderful Time of the Year?” I was singing that this morning as I was prepping all of my ingredients for this morning’s baking fun. Why are you singing a Christmas song in September, you may ask. Um, it’s football season! Woo hoo!!! After this summer’s travel adventures I experienced some of the most creative, unique, traditional, aesthetically pleasing, and delicious dishes I’d ever come upon. I say “experienced” because really good food is an experience. You woulda thought that our trip to Greece inspired these scones, but nope. Instead, I saw these gorgeous baked goods in a lovely Italian/Greek inspired restaurant in Missoula, MT. Who knew? Now spanakopita has some of my favorite things… spinach, feta, onions, oh my! When I stumbled upon the scones in Missoula I was fired up. Unfortunately I had already eaten lunch and was too full to try them when I was there (normally I would force myself to have a nibble, but I stuffed myself silly with their yummy quinoa salad). So I don’t have any frame of reference of what these should taste like. Upon the first bite, you definitely get a sweetness from both the sugar and lemon zest. Then the savoriness of the feta, onions, pepper, and salt settle in. The thing is, I don’t know how I feel about that. I almost feel like these scones are a bit confused. Are they sweet or are they savory? No judgement, I’m often confused in life, but I’m not sure that these work. Regardless they are show-stopping pretty. As I was brushing the egg wash over them, you could literally see the pockets of butter and cheese layered in between the spinach. Seriously, you’ll get lots of, “oohs and ahhs” as you serve these for breakfast or brunch. Give them a go and see what you think. DIRECTIONS: Combine the flour, sugar, baking powder, baking soda, salt, garlic, and lemon zest in a food processor. Pulse a few times to combine. Sprinkle the butter evenly on top, then pulse until the butter is the size of big blueberries. Err on the side of under- versus over-processing—if there are any stray, oversized butter pieces, just break up with your fingers. (You could also do this step with a pastry cutter, fork, or by hand! Just be wary of the butter getting too warm.) Dump this mixture into a big bowl and stick in the freezer or fridge while you prep and assemble the rest of your ingredients. When they’re at the ready, add the spinach, feta, scallions, dill, pepper, and pepper flakes to the flour-butter mixture. Fold with a rubber spatula until combined. Add 3/4 cup buttermilk and fold again until a dough starts to form (I like to switch from spatula to hand after a couple folds). Stick back in the fridge or freezer and let rest for a few minutes—the flour will start to drink up the liquid—while you preheat the oven to 400° F and line a baking sheet with parchment, foil, or a silicone baking mat. Give the dough another couple folds by hand and see if it wants more buttermilk. Add tablespoon by tablespoon—I added 2 more—until the dough just holds together. Dump onto a clean work surface or cutting board. Use your hands to bring it together and pat into a circle—9-inch diameter, 1-inch height. (The dough being perfectly cohesive or the circle being perfectly sized is less important than the dough being overworked!) Cut into 8 triangles. Place the scones on the prepared baking sheet. Brush each with the egg—covering the tops and sides—then plenty of black pepper and a bit of flaky salt. Bake for 10 minutes, then rotate the tray and lower the oven to 350° F. Bake for another 16 or so minutes until the scones are very colorful. Cool before eating—at least until warm to the touch. I like them best at room temperature. One of my favorite parts of bake day is picking the soundtrack for the morning. Ya gotta have the right tunes to groove to while you’re skating around the kitchen. Paul picked it this morning… Pandora’s Pink Martini station. Perfection! There’s nothing like a little Dean Martin’s “Everybody Loves Somebody” mixed in with Louis Armstrong’s “La Vie En Rose” along with Pink Martini’s “Let’s Never Stop Falling in Love” and dotted with Amy Winehouse’s “Valerie.” It’s just a cool cat way to start your day. Anyway, back to baking (apparently I think I’m a music commentator today). The reason that the Pink Martini station was perfect for this morning is because I made these very elegant brownies. An elegant brownie needs some classy music to help them come to fruition. They’re just pretty, simple as that. I did make some rookie mistakes with this one (darn music distracted me, that’s my story and I’m sticking to it!). I didn’t soften the cream cheese, bringing it to room temperature (shocker). I didn’t sift the cocoa powder with the flour. That woulda been smart. And finally, I used too much of the blackberry syrup to marbleize it correctly. I don’t regret this last one though because the blackberry flavor really shines through. But with those mistakes, the brownies still turned out beautifully. Even with my clumsiness, they worked. It’s a good recipe, easy to follow and lovely. By the way when the bell dinged saying the brownies were done, Sherman (our golden retriever) came bolting in ready to beg for a treat. My dog is pathetically trained to look like he’s starving every Sunday morning. DIRECTIONS: Cook blackberry puree by combining all ingredients in a small saucepan over medium-high heat for 8-10 minutes. Use a whisk or spoon to help break down the blackberries. Once cooked, place a fine mesh strainer over a small bowl and, using a spatula, squeeze through all of the liquid and dispose of the solids. Let cool to room temperature. Preheat oven to 325°F. Line an 8″x8″ baking dish with parchment paper and set aside. In a microwave-safe mixing bowl, melt the butter. Stir in sugar, eggs, vanilla extract, and salt. Once combined, fold in cocoa powder and flour. Pour the brownie batter into the baking dish, spreading evenly to the edges. Combine all cheesecake ingredients in a standing mixer fitted with a whisk attachment. Cream for 2-3 minutes on medium-high speed. Pour over brownie batter, spreading evenly to the edges. Drizzle the blackberry puree on top of the cheesecake batter and swirl using a fork, knife, or toothpick. Try to swirl only into the cheesecake batter, not the brownie batter. Bake for 1 hour, or until the cheesecake begins to turn golden and a knife inserted in the center of the brownies comes out mostly clean. Place in fridge and allow to cool for at least 2 hours but up to overnight. Cut into 9 large squares. Store brownies in the fridge in an airtight container for up to 5 days. This year Paul and I have had the true privilege of experiencing wonderful travel and food adventures. Nashville, Greece, Montana… oh my! I’ve gotten the chance to try tons of delectable dishes (and some not so delectable) that I’ve never even heard of. It’s been awesome. One of these dishes was bonuts from Biscuit Love in Nashville. I’ve written about Biscuit Love in a prior post, but one treat we saw there were said bonuts (we didn’t partake in them because we stuffed ourselves silly with other plates). I had never heard of such a thing. How good would deep fried buttermilk biscuit dough be?!?! This was one dish I was determined to try. Hence, this morning’s experiment. Now, I rarely fry anything. Not because of calories and fat and all that sensible stuff. But because I’m terrified of two things… giving myself 3rd degree burns and setting the kitchen on fire. Luckily neither of these things happened. Now, I love me an Iron Chef as much as the next person but I think Bobby Flay made a few mistakes in his recipe. First of all he calls for cream but doesn’t mention when to add it into the batter. After I added the buttermilk, there seemed to be enough moisture so I just skipped it. Another conundrum I faced was rolling the dough into balls. Most bakers know that if you overwork the dough, it will get tough. I did it anyway but with great hesitation. I’m not sure how you get around this to make the bonut but it was a touch nerve-racking. I also rolled my bonuts in regular white sugar rather than powdered sugar. I just think it’s prettier and tastes better. Biscuit Love serves their bonuts with lemon mascarpone and blueberry compote. I didn’t have mascarpone so I subbed in ricotta. But I think mascarpone would’ve been smoother. Instead of blueberry compote, I dipped these pillows of loveliness in huckleberry jam. Huckleberry jam is what is right with and all that is good in the world if you ask me. We were in Whitefish, Montana a few weeks ago and I bought this amazing concoction at the Huckleberry Days festival with the specific idea of serving it with the bonuts. I love Montana! Definitely give these a go! They are wonderful! DIRECTIONS: Heat the oil in a Dutch oven until it registers 360 degrees F on a deep-fry thermometer. Put a rack on a baking sheet. Combine the flour, baking powder, baking soda and salt in a large bowl. Cut in the butter using your fingers or a pastry cutter until the mixture resembles coarse meal. Add the buttermilk and mix gently until a dough just begins to come together. Roll the dough into a square about 1/2-inch thick. Cut the dough into 1-inch pieces and roll into balls. Working in batches (so the doughnuts have plenty of space to float in), fry the dough balls until golden brown and cooked through, about 4 minutes. Use a slotted spoon or spider to transfer the doughnuts to the rack. Let cool slightly. Serve immediately. Lemon Ricotta Dip: 2 tablespoons-ish sugar, 1/2 cup ricotta cheese, 1 tablespoon-ish lemon zest, 1 tablespoon-ish lemon juice ~ stir it all up. Huckleberry Jam: Order from Shelly’s Jellys, LLC.